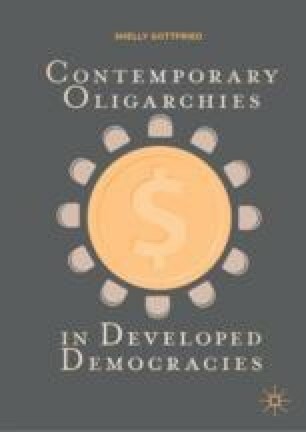 The following two chapters examine the main stages of the formation and evolution of oligarchy in most states in which oligarchy was an outcome of the transition from market coordinated economy to a so-called free-market mode; this chapter thus analyzes the way the oligarchy consolidated and commandeered the economy following the implementation of key reforms. The first stage is defined by privatization and the subsequent emergence of new business groups, and is the topic of this chapter. The second stage of the rise of the oligarchy, which traditionally took place in the early 2000s, evolved as a process of financialization and is the topic of the next chapter. This chapter describes the ensuing transition from the old business groups or corporations to pyramidal business groups, showing how this process resulted in a few individuals becoming extremely powerful and wealthy, by means of their control over the market. This was largely due to the way in which states conducted the privatization process, along with their retreat from an active role in the market and from solid and robust responses to economic changes, and not due to oligarchies’ competitive virtues. This development or mechanism of wealth accumulation was a political rather than purely economic process, with its beneficiaries tightly linked to the political circles. The assets of the states were privatized with the logic of transferring control to a stable pool of shareholders. Bernanke, B. S. (2007). Subprime Mortgage Lending and Mitigating, Testimony Before the Committee on Financial Services. U.S. House of Representatives [Online]. Available: http://www.federalreserve.gov/newsevents/testimony/bernanke20070920a.htm. Accessed 3 April 2012. Byanova, N., & Litvinov, A. (2003, December 24), Russian Pogrom Against the Oligarchs. Gazeta, Brought in Rutland, P. 2005. Business-State Relations in Russia. Available: http://prutland.web.wesleyan.edu/Documents/berlin1.pdf. Accessed 2 December 2017. Dornbusch, R., & Edwards, S. (1989). The Entrenched Power of Oligarchs in Latin America. NBER (Working Paper No. 2986). Available: http://www.nber.org/papers/w2986. Accessed 13 March 2013. Feinstein, Y., & Ben-Eliezer, U. (2018). Failed Peace and the Decline in Liberalism in Israel: A Spiral Model. Mediterranean Politics. https://doi.org/10.1018/13629395.2018.1434595. Israel Ministry of Finance. 1995. The Brodet Committee Report—The Committee to Examine the Various Aspects of Banks’ Holdings in Real Corporations. Available: http://ozar.mof.gov.il/hon/2001/hon_dep/memos/vaada1995.pdf. Accessed 5 November 2013. Israel Ministry of Finance. 2005. The Bachar Reform: Structural Reform in the Capital Market—Inter-Ministerial Committee Report. Available: http://ozar.mof.gov.il/bachar/asp/reformreport.asp. Accessed 5 November 2014. Israel State Comptroller and Ombudsman. 2001. Report 51B for 2000 [Hebrew]. Available: http://old.mevaker.gov.il/serve/contentTree.asp?bookid=156&id=2&contentid=&parentcid=undefined&sw=1920&hw=1010. Johnson, S. (2009). The Quiet Coup. The Atlantic, 52. Available: http://www.theatlantic.com/magazine/archive/2009/05/the-quiet-coup/307364/. Accessed 24 January 2018. Kosenko, K. (2013). The Nature of Organizational Hybrids: Exploring the Evolutionary Dynamics of Israeli Business Groups, 1995–2008. SSRN. Available: http://papers.ssrn.com/sol3/papers.cfm?abstract_id=2287530. Accessed 29 September 2014. Putin, V. (2006, May 10). Annual Address to the Federal Assembly of the Russian Federation. Available: http://archive.kremlin.ru/eng/speeches/2006/05/10/1823_type70029type82912_105566.shtml. Accessed 19 March 2014. Rolnik, G. (2017). Analysis ‘Fishmanism,’ the Exclusive Club That Stunts the Israeli Economy. TheMarker. https://www.haaretz.com/israel-news/business/.premium-fishmanism-the-exclusive-club-that-stunts-the-israeli-economy-1.5483421. Shumilov, A., & Volchkova, N. (2004). Russian Business Groups: Substitutes for Missing Institutions? Center for Economic and Financial Research (CEFIR) (Working Papers w0050). Available: https://ideas.repec.org/p/cfr/cefirw/w0050.html. Accessed 3 September 2017. The State Comptroller of Israel. 2012. The 2012 Committee to Examine Crony Capitalism, Appointed by the State Comptroller of Israel in 2010 [Hebrew]. Available: http://progdemocracy.files.wordpress.com/2012/07/d793d795d797-d7a1d795d7a4d799-d795d79ed795d793d7a4d7a1-d7a9d79c-d794d795d795d7a2d793d794-d799d795d7a0d799-2012.pdf. Accessed 14 June 2014.